Even if bell peppers aren’t grown locally, you can still get a high quality pepper at the store since they ship well. When are peppers in season? Farmers in areas with hot climates can pick peppers as early as June. Harvest ends in mid or late fall depending on your region. Most regions of the country grow bell peppers. See what else is in season at the same time: June, July, August, September, October, and in coastal climates, November. To pick the best peppers, make sure the pepper is firm (soft spots indicate a decline in quality). Also look for shiny, tight skin – wrinkles are a sign that it is losing moisture and isn’t as fresh. Unlike tomatoes and other more delicate produce, peppers actually ship quite well, so if they come from another part of the country, their quality should still be pretty good. To store, put them in the crisper drawer in an open plastic bag. They should last up to a week. Green peppers usually last longer than the more ripened colors. What’s the difference between the red, yellow and orange peppers? And why are they more expensive? 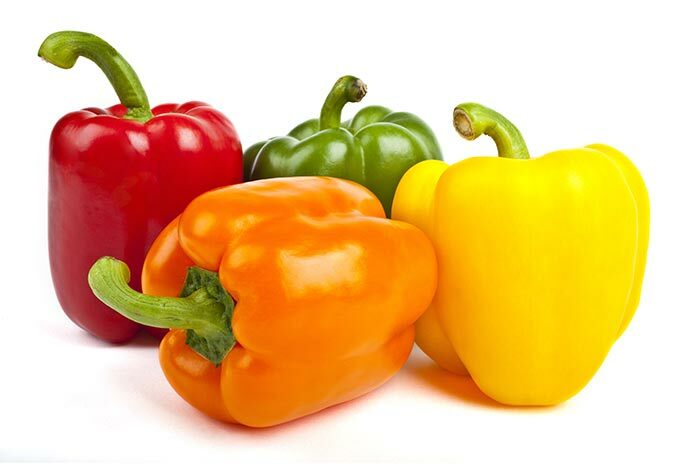 Orange, yellow and red peppers start out as green peppers. They turn different colors as they ripen, depending on the variety. Because green peppers haven’t spent as much time ripening, they are almost always less expensive, first to arrive in farmers markets, and have a slightly more bitter taste. Another factor that makes green bell peppers cheaper, is that if you are continuously picking them off the plant, the plant will keep flowering and producing more peppers. But when you leave them on to ripen to yellow, orange, or red, you don’t get that extra production from the plant. Should I buy organic peppers? If it fits in your budget, definitely! The non-organic health risk of the pesticides found in sweet peppers is high from the US (very high when from Mexico). Based on the information that Consumer Reports published, that means you would need 1-5 servings in a day to exceed the level of safety set by the EPA (or just 1 serving if it’s from Mexico). The data collected by the EPA looks at the toxicity and amount of each pesticide found in the edible portions of the fruit. The full details can be found over on the Consumer Reports website. Some people don’t like the slightly bitterness in bell peppers and prefer yellow, orange or red ones. But the bitterness can work in your favor if you add them to rich or sweet dishes, since that bitter flavor balances it out. Green bell peppers on a pizza with all of that rich cheese and sausage? Perfect. On a salad with bitter greens – not so good. I’ve seen this shared a few times on social media: the number of bumps on the bottom of a pepper tell you the gender, and that one gender is better for cooking. This is a myth – there is no gender for peppers. They all contain seeds. Different shapes, sizes, and colors are determined by the variety and growing conditions of the plant. Each recipe below only uses ingredients that are in season at the same time as peppers, or ingredients that have a year-round season. Since their season overlaps with the beginning or end of other fruits and vegetables, the recipes are grouped into early season, late season, or anytime they are available. Fajita chicken kebabs – get the recipe from Well Plated.